I received this fun stamp from Sasayaki Glitter called Christmas Frog and had to color it in. I ended up fussycutting the image because I decided that I would like to turn it into a shaker card. I used my Zig Clean Color Real Brushes to color in the frog. Instead of using sequins for the shaker portion of the card, I used seed beads and added 3-4 sequins and some green holly leaves. I stamped the sentiment and freehand the banner. Such a cute mix. Shaker, Christmas, holly leaves and then that silly, sweet FROG wearing a Santa hat. So unexpected. Great coloring too. What a beautiful shaker card! Love that image! Thanks for joining our challenge this week with Kraftin Kimmie Stamps. Fun and fabulous! Great design, love the festive frog and the shaker element! 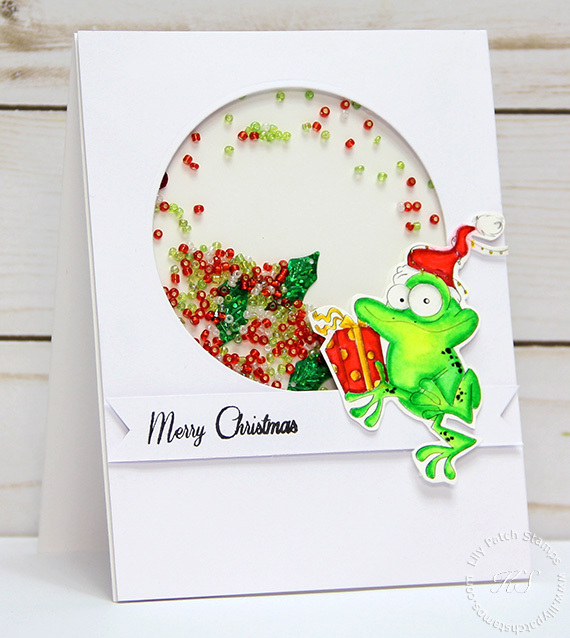 What a lovely shaker card and your festive frog is great fun! Beautifully done. I love window cards and this one it just the bright and chirpy one to begin the holiday cheer!! Thankyou for joining us at happy Little Stampers Anything Goes with DIes October challenge. All the best.